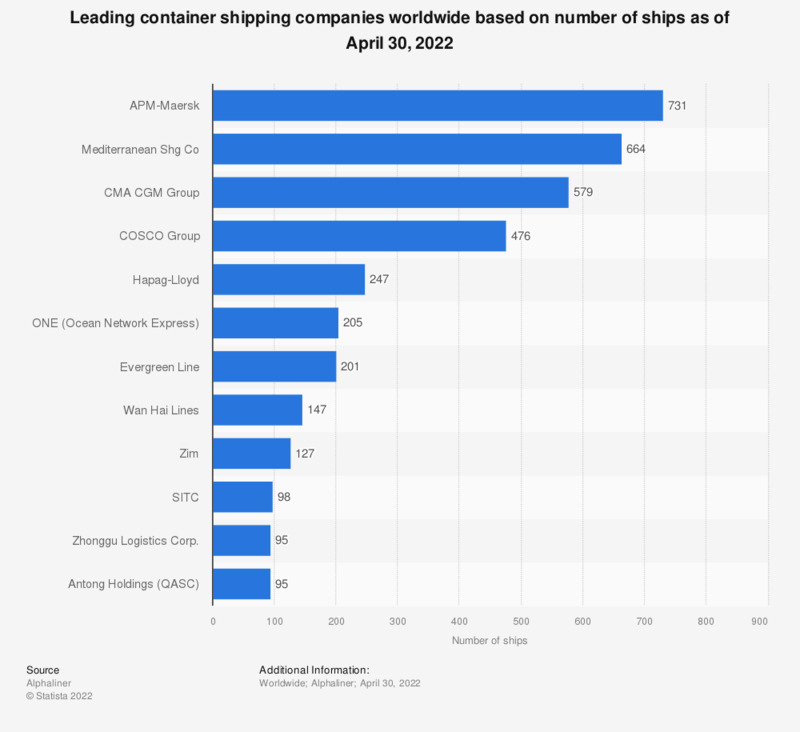 This statistic displays the leading container shipping companies worldwide as of March 27, 2019, based on the number of owned and chartered ships. There were 235 ships in Hapag-Lloyd's fleet in March 2019. Global seaborne trade was revolutionized in the 1950s, when the intermodal container was invented. Prior to the introduction of standard containers, cargo shipping used to be a lot more expensive, as well as time-consuming. In the late 1960s and early 1970s, the International Organization for Standardization (ISO) defined the capacity of intermodal containers, making the twenty-foot equivalent unit (TEU) a standard measure used in the transportation industry. Today, between 80 and 90 percent of containers shipped around the world are either forty or twenty foot standard length containers. The world’s largest container ship operator, APM Maersk, has the capacity to transport around four million TEU containers on its ships. The Danish shipper has some 699 ships in its fleet, some 380 of which are chartered ships.